I think we do quirky, unusual and eye-catching quite well with the 3D designs and props that we create for the marketing and advertising industries. But yes, you can always learn more. You can improve systems and fine-tune techniques, but sometimes you need to step further away, take a wider view, and maybe do things that are a little different from the norm. 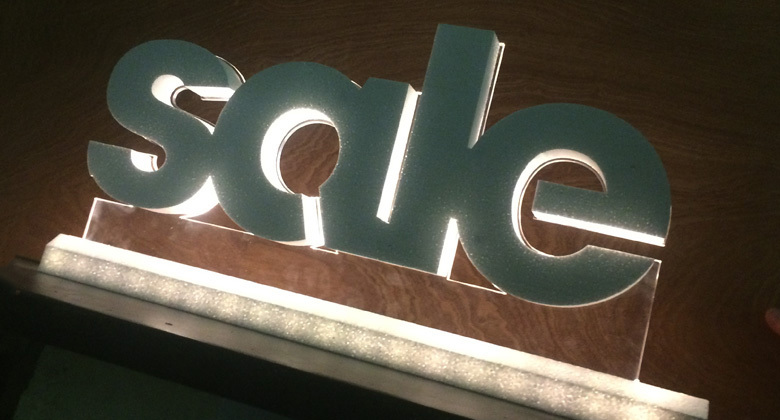 Lighting can bring a new dimension to props and signage as we have seen used at several events. At this event for TBEX Ireland, our client used the basebar under the lettering to effectively camouflage the lighting equipment so no letter or part of the sign was obstructed. The uplighting on the white letters really elevated the presentation taking it to a new level. We saw great lighting used during an interview on RTE where the set designers actually projected different images onto the letters while filming international rugby star, CJ Stander. This means the sign can be used again and again for different events simply by changing the image that is projected giving a completely different look each time. Recently we have been experimenting with lighting. Some ideas worked and some didn’t but it was exciting to see the different looks that could be created through various lighting setups. If you have an idea you would like to try out get in touch and maybe we can help shed a little light on it for you. Error: Error validating access token: Session has expired on Monday, 11-Feb-19 07:28:46 PST. The current time is Monday, 22-Apr-19 01:52:07 PDT.